You will be given a reference e-book to read which has 219 pages And the test will be based on that e-book , you can take final test within 1 year of purchase. Google website optimizer is known as a multivariate testing service offered for free which allows you to easily rotate various segments of your contents into sales pages in order to determine which among the combinations and sections has the highest conversion level. This also refers to a free website optimization tool which is extremely useful for webmasters and online marketers in their attempt to further increase their visitor conversion rates and the satisfaction rate by continuously testing various web content combinations. This tool can actually test all existing HTML code elements in a page such as headlines, fonts, product copy, product reviews, product images, forms, headlines, calls to action and point of action assurances. In order for you to start using the Google website optimizer, you need to first set up experiments for the different elements of your web pages. You can then expect Google to serve the various versions of your web pages randomly to actual visitors who view your site. Google website optimizer is actually more beneficial than the process of testing your pages using those people who are not suitable for your target market. With the help of Google website optimizer, you get a hundred percent assurance that all those who have participated in the tests are among your target visitors or target market. If you want to take up a Google website optimizer certification course, then be aware that nothing can beat the comprehensiveness and accuracy of the program offered by Brainmeasures linked to this subject. The Google website optimizer course which is provided by a reputable online certification company called Brainmeasures is guaranteed to cover all topics linked to the proper ways of using the Google website optimizer and how you can generate the most favorable results out of it. With the help of this certification course, you will no longer find it hard to learn the basics of website optimization and greatly improve the performance of your site through it. It should also be noted that the website optimizer test is one of the most essential parts of the program since it aims to evaluate if the level of your web optimization knowledge and skills is already enough to make you worthy of holding the Google website optimizer certificate. The certification course is indeed a major help in making you an expert in effectively handling the Google website optimizer service. 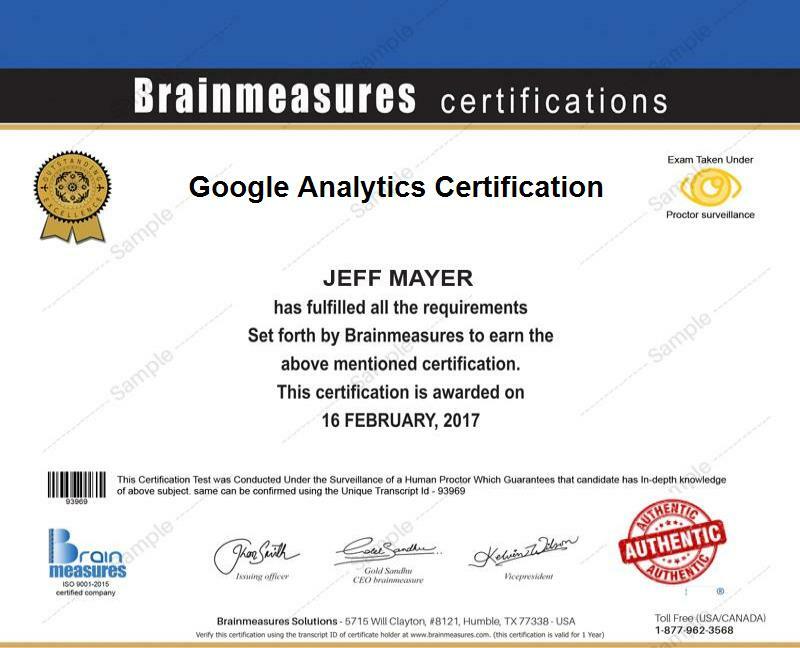 The presence of the Google website optimizer certification program from Brainmeasures is extremely beneficial for a lot of people. The certification course is primarily designed for the non-technical and technical individuals who are working in the sales, marketing and web development departments of an organization and whose responsibilities include improving the performance of their websites and the results of online marketing. The Google website optimizer certification course can also work perfectly for professionals who are working in non-profit organizations, government, small and medium-sized enterprises and corporations. A Google website optimizer certification is also an instrument towards greatly increasing the amount of salary that you receive. In fact, you can expect your income to quickly grow as you gain more and more knowledge and experience in the field of website optimization. A Google website certification holder who is still a beginner in the field can expect to receive an average annual salary of $121,000 according to Indeed.com.